The original design was believed to be the one provided bu Minolta. Crisp image towards the corner and rich rendering of the tonage with slight fall off are noted. The lensehood #12523 euipped with a small knob to turn PL filter. Lense cap #14184 diameter 63.7mm. The lense cap's cut-out is for the purpose to match the lense's pin, however, that cut-out does not work properly when euipped with a filter. On R7 you'll see the dynamism of wide-angle lense which is inherently attracts those who interested in taking picture. 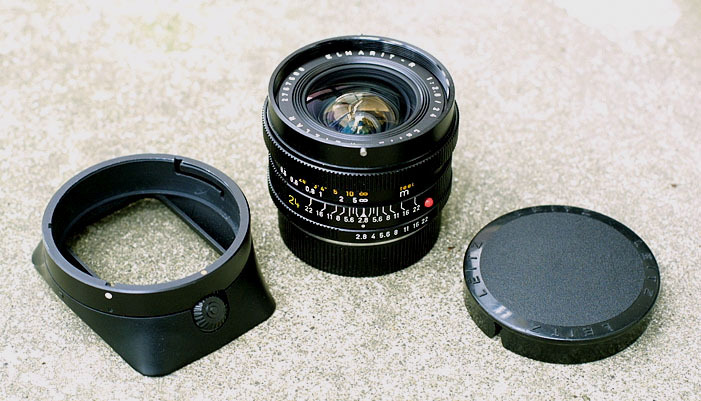 This lense is suitable after SL-2 and can not mount on Leicaflex or SL. The puzzle is the lense sometimes goes into SL which cause a trouble of unmount. This lense is not really a famous one compared with its M namesake, but one can expect more when looking through the view-finder. Picture on the left shows Elmarit-R 24mm/f2.8 and right shows MC-W Rokkor 24mm/f2.8. They are identical to each other. Only difference is that Elmarit has a wider openings at the front element.